Patrick Henry, one of the most successful criminal attorneys of his time, garnered a reputation as a brilliant orator after his defense of the natural rights of Americans against King George III’s interference with the tax laws in Virginia. He served in the First Continental Congress, and in 1775, at the Virginia Convention, he sponsored measures for armed resistance to the British. 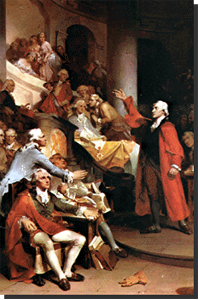 He was a delegate to the Second Continental Congress, and then opposed the Constitution because he thought it didn’t provide sufficiently for states and individual rights. Because he was concerned about the federal government’s authority, he championed the adoption of the Bill of Rights. Near the end of his life, he became more and more alarmed at the spread of deism and atheism coming from what he called France’s “godless revolution.” He served five terms as Governor of Virginia after the War. Although he was offered positions in the administrations of both Washington and Adams, he declined due to his health. "This book is worth all the books that ever were printed, and it has been my misfortune that I never found time to read it with the proper attention and feeling till lately. I trust in the mercy of heaven that it is not too late."